Thea Schrack was born and raised on a ranch in Chadron, Nebraska. She received a B.F.A. degree from the San Francisco Art Institute and is currently a fine photographer in San Francisco. Ms. Schrack’s love and understanding of nature is evident in all her work. Thea is represented by a number of galleries; her work is appreciated internationally and is published extensively. 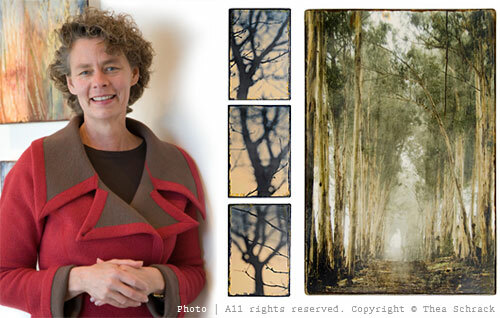 Throughout her artistic journey, Thea has focused on capturing the beauty of nature. But reality is just the beginning. Her first foray was into hand-colored photography. This technique uses reality as its base and transforms with color and shading. Ms. Schrack has moved on to revisit the ancient art of encaustic painting. Again, Thea starts with the reality of a photo, then paints over it with wax and sometimes color to transform the actual into the surreal.